Okay okay, so today’s topic has been in the oven for quite some time now but I think I finally have the right dishes to place it in. Before we start, let’s VOTE! 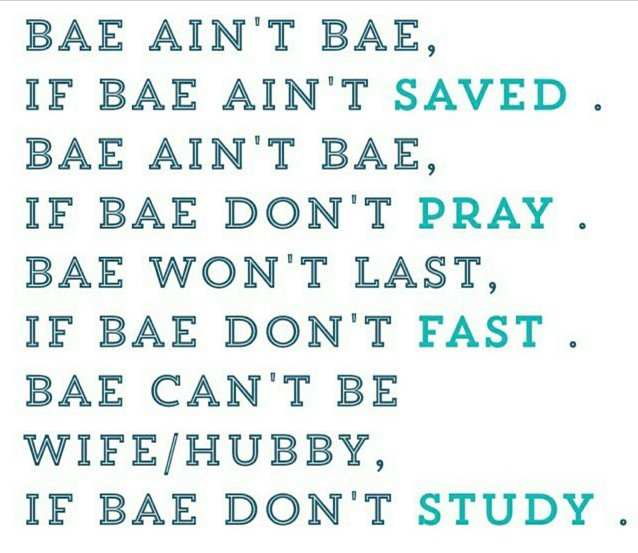 I don’t know if it’s just me but it seems like the world now revolves around “Bae”. I’m talking to a guy friend I haven’t spoken to in a while and one of the first questions he throws at me is: “How is Bae?” Please who is this bae we all speak of? I kid I kid. I know bae very well because I think about him every now and then. I’ve had this conversation I’m about to have with you all with my close friends and I’m pretty sure a lot of young ladies silently/loudly have the same thoughts. So, you’re welcome in advance as I’m about to let it out. Now on a more serious note, I won’t necessarily say I’m at that age where I need to start fretting about not finding a better half yet; not even close. I won’t however deny the fact that every time I see a “happy couple” I wish for bae too. I’ll stop there but if you’ve been reading my blog frequently, you might be able to guess my reply. Before I go on, I apologize in advance for being gender biased as I’m going to be speaking more from the ladies’ perspective. But! Let the guys stay tuned for theirs right after this. Someone once said, the second most important decision you’d make in a lifetime is who you choose to marry; with salvation being the first of course. I cannot agree less with this,which is why I won’t rule out anyone for being too young to talk about relationship matters, the earlier you understand what to except, the easier it is for you to wait on the best God has for you. So why is having a relationship with God my number one turn on? When you are in a relationship with someone, whether you have intentions of marriage or not, you’ll start to make decisions knowingly or inadvertently around that relationship. As humans, we crave companionship and when we find that one person we can spend so much time with and not get bored, we’d do anything to keep that boat floating. No matter how strong headed you think you are, the person you are with can make and break who you’ll become; we are talking emotional attachment here people. So as a young christian lady, maybe you’re newly saved or you’ve been on this road for a while, either way, you are making an effort to build your relationship with God. Then a guy comes along, he’s heard about God but he really doesn’t have the “time” and strength to be committed to him what makes you think his commitment to you would be genuine or long- lasting? Before he can put you “Before Anyone Else” (BAE) he must have put God ahead of you. One fact I have learned in my Christian journey is that, when you walk with God, he puts your life in order. When a man commits to God, his state of confusion is less of a concern because he would know to a reasonable extent what he wants and where he is going. Personally, this would save me a lot of stress trying to explain to him why something is wrong or right because he already knows!, the Holy Spirit resides in him so you don’t have to add that to your job description. If I am making so much effort to know more about my creator and move closer to him, do you think it would be wise to date someone who doesn’t even understand, a tad bit, what’s going on in my spiritual life? Does a relationship with God guarantee a perfect man/relationship? I wish this were true, but it is not. We are humans and the flesh is always going to be against us. Loving God doesn’t exclude you from mistakes but it convicts you to realize it is even a mistake in the first place and to seek a way out of it.Only a man who truly loves God will understand exactly how to love and care for a woman. If he’s an apprentice in the house of the author of love himself, my sister that’s unadulterated love coming your way. Walking with God equates to you trying to be more and more like him; do you know how much wisdom comes with that? You can’t be guaranteed a drama-free relationship but you can be sure every problem will be solved from a fountain of wisdom. His human nature will definitely come into play every now and then but you’d have enough confidence to stay put because you know there’s a bigger force within him. Can I change him though? Please quote and unquote me: ONLY GOD CHANGES PEOPLE. My dear sister, don’t take up God’s job, you cannot change a man. I have been there, I have done that. If you attempt to go into a relationship with the motive of changing him later on, you’re setting yourself up for doomsday. I understand life happens to us sometimes and Mr. perfect self comes along; he has everything a Cinderella could ever wish for except that one thing- God. Then we try to convince every cell in our body, in a every way possible, that we can turn things around as we get caught up in the cross roads of “almost Mr. right”. Salvation is a personal decision and only God can influence that decision. Fine, God assigns people to be instruments of salvation but you can’t be that instrument if your vision is clouded by emotions.If you feel God has called you to be a saving grace and you’re strong enough not to stumble in your own faith, put the love story aside for a while and concentrate on being a friend and a spiritual assistant. Please, do not test your faith trying to be a savior in a relationship. Finally darlings, you’re not too young or too old to wait on God’s best for you. Let the kingdom of heaven be your number one priority and all other things will be added on to you. I also understand that there comes a stage in a woman’s life where you’re just an inch away from settling, please don’t. This is when you should fasten up your spiritual seat belt and ask God to take charge of the plane. Don’t settle for what will rid you of your heavenly home. A man is supposed to help you grow in Christ not distract you from that goal. A man is meant to walk with you on the path to righteousness not distort your vision. Don’t let the world give us a different standard, we already have one we live by. I need your replies!!! Please don’t let me look like a mad woman talking to myself, lol. Use the comment box for questions and thoughts, share the link to this post (someone needs to know). Guys remember to stay tuned, follow my blog if you need a reminder when yours is posted! This entry was posted in BE INSPIRED, LOVE AND EVERYTHING NICE and tagged Agape, Bae, Christ, drama, God, happy, love, man, marriage, relationships, wedding, woman. Bookmark the permalink. Actually,my boyfriend talked me into giving my life to Christ. All he does is go to church,he talks about God almost all the time. I can say hes a devoted Christian. He has changed so many people’s lives. And its very true that a man who knows God treats his woman better. Hes still the most caring man ive been with so far. He has the fear of God and I’m sure thats the reason why he cares about other people’s wellbeing. Not just his girlfriend’s but everyone around him. And this is not just a coincidence. Ive notice that guys who are not God fearing act anyhow. They say whatever to people,they dont care if they hurt other people’s feelings. But when you’re God fearing,you’re humble. You have respect for your girlfriend and you act right. I really feel you on this. This is nothing but the truth. Wow! That is so awesome! I’m glad you’re a living testimony to that. Thanks for reading hun! Young people are usually afraid to speak this honestly about Bae and the relationship with Christ. Nice Nice Nice… Great write up on an important piece of fact. Hard to adjust buh truth serves best… Good understanding God bless Ur head. U jst reminded me u can’t change pple. You know a lot of times we have a relationship with someone that isn’t saved or is a ‘floating’ Christian (That is someone who is a Christian just because, but not born again). And we really think we can change them and influence them for the better and that they’ll break when they see God in us. But the truth is that this is a 50-50 kind of gamble. Because it’s either you succeed in pulling them up from the sinking sand and clay up to the mountain top, or they pull you down into the clay with them. And that is not a gamble I wanna play anymore with my salvation. We can’t be happy when we have BAE if we weren’t happy and fullfilled while single. Let God take charge during your single time and build and mould you. And keep praying for BAE where ever he is, so that when you eventually get BAE, it will be how you imagined it would be…or even more. Bless you sister. Great post. Thank you so much Yinka! Yes! I definitely pray for BAE wherever he is that God is moulding him into someone who loves him whole heartedly. Thanks for reading! Okay Ladies this is for you ! let’s Talk about BAE ! I was immensely blessed by this, you ought to be too. Have a good read ! This I must say is a very thoughtful write up. A lot of young people seem to ignore God in the “Bae matter”…God bless you for sharing this. You’ll have me coming back for more posts. Woow..am so gonna reblog this..This is as awesome as the word awesome, God bless your write up..truth is rare.. Thank you. I’m glad you were inspired. This is super awesome Moyo! Well done! A princess is her Father’s pride, most times the most beautiful in the land. So her Father goes out and seeks for her a prince; strong, brave and handsome. Someone worthy of her beauty, dignity and His name. God does the same for us. He desires nothing more than for us to find our perfect half, someone who will treat you with the wisdom He has made you.Someone who doesn’t know we’re priceless won’t treat us as priceless now, would he? He has given us a choice to choose who will rule over us as our husbands so it’s left for us be sensitive and welcome someone we know we can lean on when we’re weak in the spirit, someone who has the spirit of God in him and speaks Jesus. Thank you Tomi, for your contribution, we are indeed crowned queens! Moyo, Moyo, you have written well. More grace sis. Yesss, beautiful piece, I can see your mindset is awesome, we need more renewed minds in the world today, Bae isn’t Bae if he doesn’t fast. Loool. It’s important that the generation of today starts thinking of everything God inclined. He created us people! We owe it all to him, we all shouldn’t make the mistakes our parents made, we think money fixes it all. Our parents just keep hiding it from us! We need God. And I’m so happy people like moyo are taking things of God with great importance. Our world couldn’t be better. Let’s get to know our societies are moulded from our families. Bae isn’t Bae, when you don’t regard God, Bae isn’t bae if he sees Kanye as his god. Please, that’s so far from being right. Thinking he’s all dope and stuff, I saw this somewhere that David in the bible did something for 576 million dollars. Covers face *! I really can’t remember where and what he used it for. So, God blesses and rewards those who trust in him and love Him. Please. Enough of the devil’s scheme on us. Let’s embrace the love of God, cause it’s perfect and it leads to peace both here and the next . May God lead us all. Amen in Jesus name. You have so much wisdom darling! Thanks for reading and sharing your views. May God add to your knowledge. Really inspiring . I personally think ladies need to read this. It has given me the courage I need. You are blessed sister! Wow! flabbergasted once again, keep listening to God and make His word known to all, “Speak”on speaker! May God bless your heart! This spoke to me. I hope it helps someone else. un-baed”him ASAP and after that I got to discover so many ugly things about him….many people would have thought about how long they’ve been in the relationship and try to patch it up..my dear, move on and don’t try to do God’s work for him….you’ll find your God sent “bae” soon.. Thanks for the comment! Very true. When I saw your poll, I almost voted for all of the above. Then iremembered, “all these things shall be added unto you”. God is the beginning and end of it all. Sometimes people think they don’t wanna be labelled a church freak. But the way I see it let them label me a Jesus Freak!! I am proud of such a label and far be it from me to take off that label where guys are concerned. More Grace to you, in Jesus’ name.